With the supplement DOG FIT by PreThis® WHITE dental, with the power of the brown algae AscophyllumNodosum for healthy dog teeth without tartar and plaque. DOG FIT by PreThis® WHITE dental is also very well tolerated and is also suitable for sensitive dogs. Free from lactose and Gluten! With DOG FIT by PreThis® WHITE dental the dental health of your dog are optimally supported by covering damaged tooth and dental stone replaced and the deposited new coatings is prevented. Dogs can not go to the dentist – nevertheless suffer under tartar and plaque. These are not only ugly but also an ideal breeding ground for bacteria cultures. Once germs have are fixed, it is difficult to get rid of it because the coverings are often very stubborn and with traditional means little to remove. The bacteria produce during your metabolism produces foul smelling gases, the unpleasant smell during the mouth dog. The enamel is also attacked and cavities and holes. In dogs is mostly only a teeth cleaning under general anesthesia. However it is stressful for the dog, not completely harmless and for the holder usually expensive – it makes more sense to act and therefore before the teeth healthy from the outset to maintain. Die The North Atlantic brown algae AscophyllumNodosum is to remedy this situation. Their unique composition of various minerals and trace elements is different existing tooth stone so that it can be easily removed. It also prevents new tooth coverings settle. So have harmful bacteria in the mouth no chance. A further positive feature of the brown algae is its high content in algi formats. These bind toxic heavy metals in the digestion so that this of course can be eliminated without damage. DOG FIT by PreThis® WHITE dental contains a high concentration of ascophyllum-nodosum extract. In this way can the high-quality product on its positive effect on dental health can ideally unfold. Since it is also free of lactose and gluten is DOG FIT by PreThis® WHITE dental very well tolerated and is also suitable for sensitive dogs. 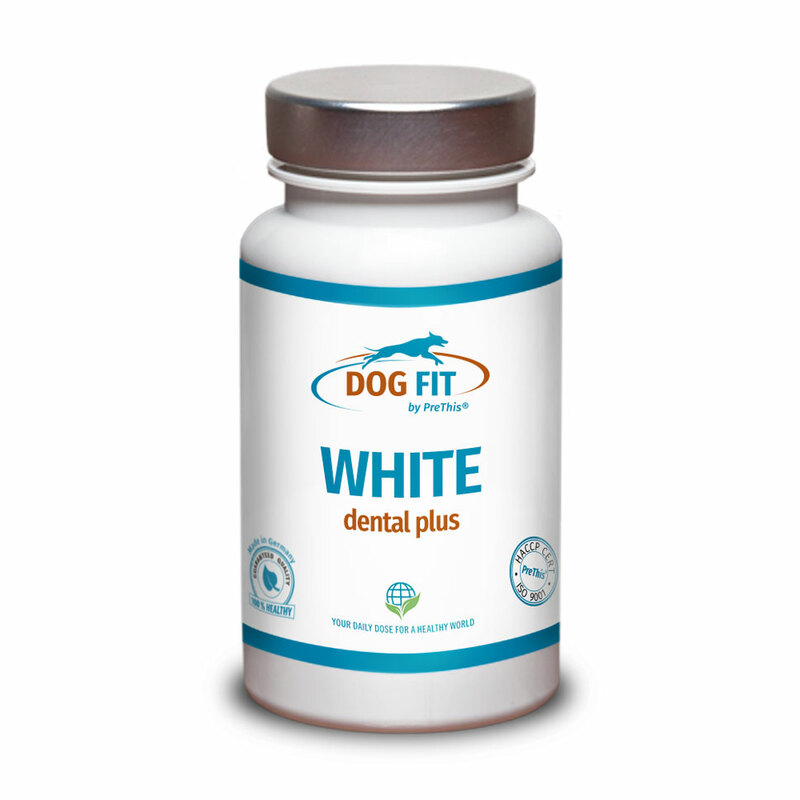 The gift of white not only helps to fight existing dental problems in the dog, but also to prevent their creation. A preventive administration is highly recommended. In addition to this it is recommended that the administration of DOG FIT by PreThis ® Fresh for a pleasant breath. Order DOG FIT by PreThis® WHITE dental now! Up to 20kg weight of the dog is sufficient for 2 months, over 20kg is sufficient for 20-30 days. Free from milk sugar and gluten.